Built in 1958 by the Alexander Construction Company is this expanded Palmer & Krisel-designed home in Sunrise Park in Palm Springs, CA. 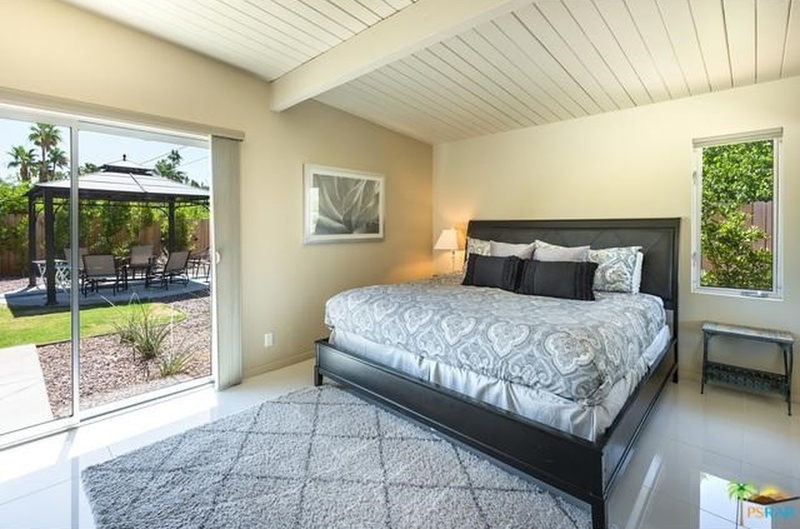 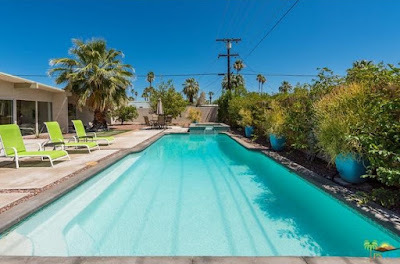 With four bedrooms and three bathrooms in 1,783 square feet, an in-ground pool and spa and a two-car carport all on a 10,400 square-foot lot, the asking price on this home is $699,000. 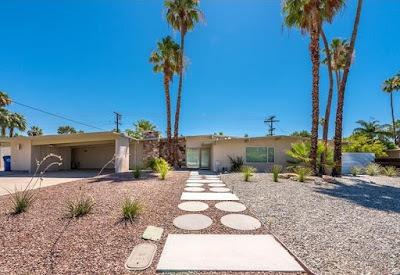 The front of the home features a split-toned red-ish and grey-ish gravel front yard, with minimal desert planting interspersed amongst the yard. 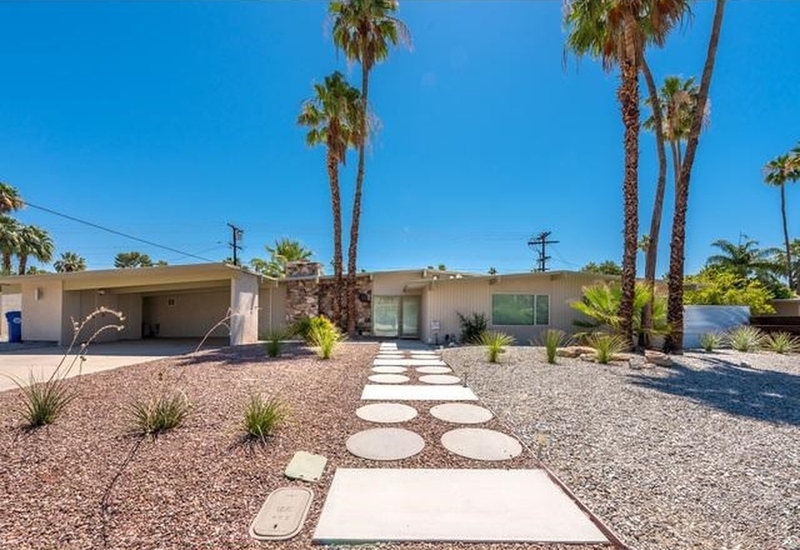 The front pathway features a combination of rectangular and circular pavers leading to the front glass-paned front door. 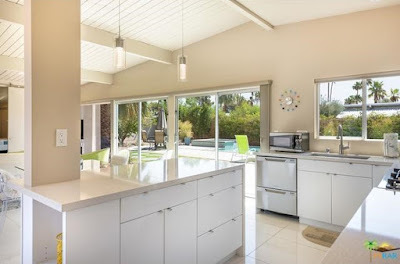 The original carport has been enclosed, but an architecturally compatible carport with storage has been built on to the front of the home, adjacent to the original carport location. 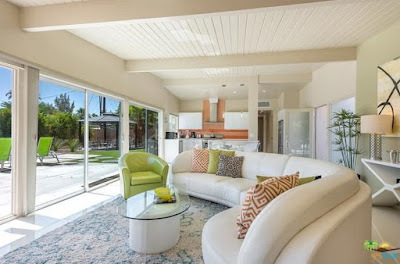 The entry opens up into the rear-facing dining room and living room, which features striking floor-to-ceiling windows overlooking the backyard and swimming pool. 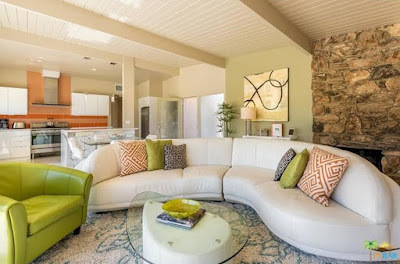 High-gloss white porcelain tile lines the home, and the front wall of the living room is anchored by a stone veneered fireplace. 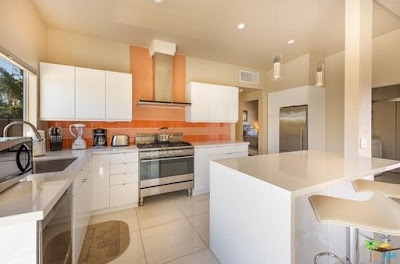 The demising wall between the entry hall and kitchen has been removed, and the kitchen has been expanded to include the original hallway space. The fridge sits where a hall closet once stood, and a large central island with waterfall countertop sits between the kitchen and dining. 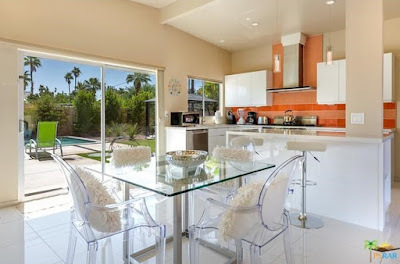 Cabinetry is all white, clean and modern coupled with quartz counters, while the backsplash behind the range features eye-catching orange and tangerine colored tilework. 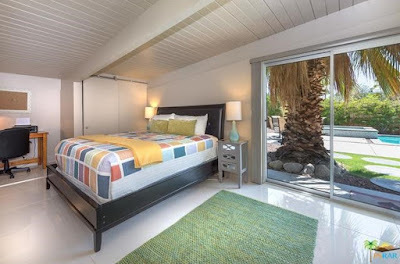 The master suite is entered through a pair of barndoors off the living room, and sits in the former carport. 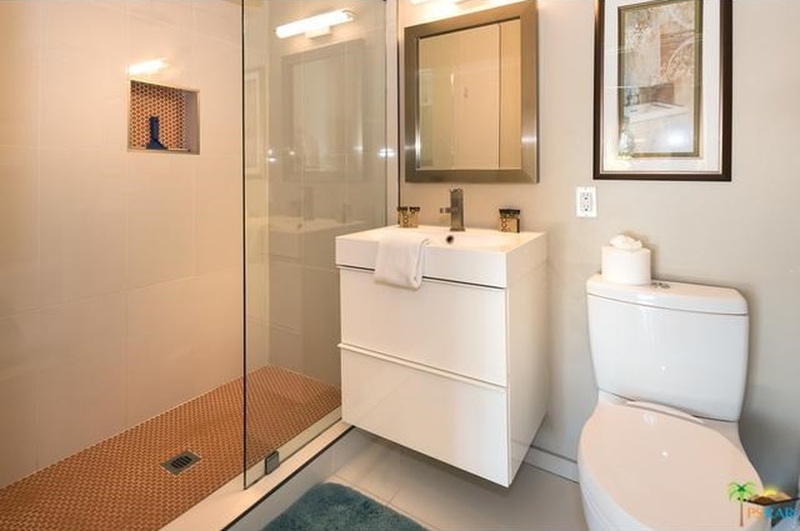 A large slider provides backyard views, and the adjacent bath features clean and modern fixtures with orange tile accents. 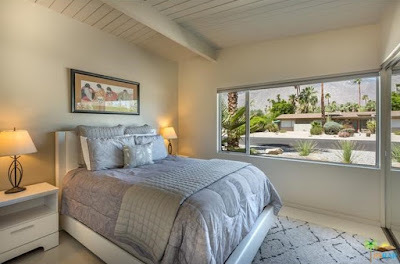 The original secondary bedrooms sit at the front of the home overlooking the front yard, and the original master bedroom overlooks the backyard. 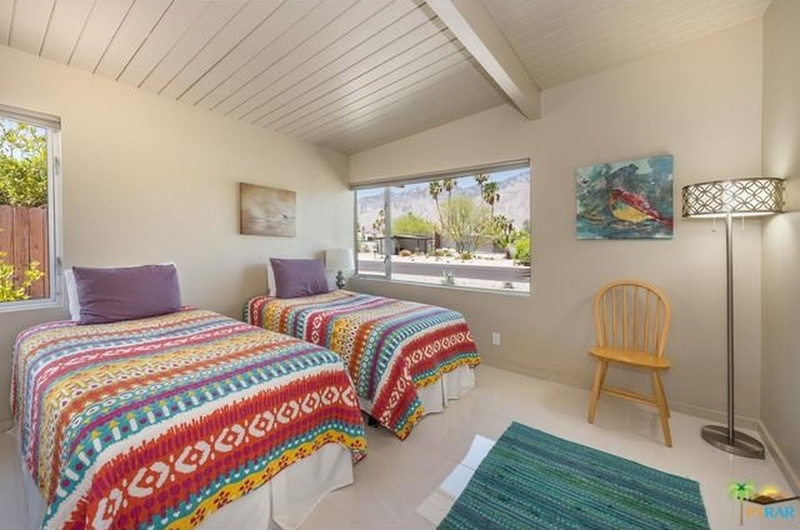 All of the original bedrooms feature the original open-beamed vaulted ceilings, and are relatively diminutive in size. 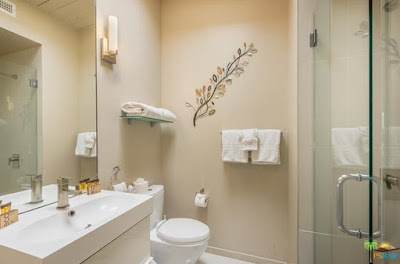 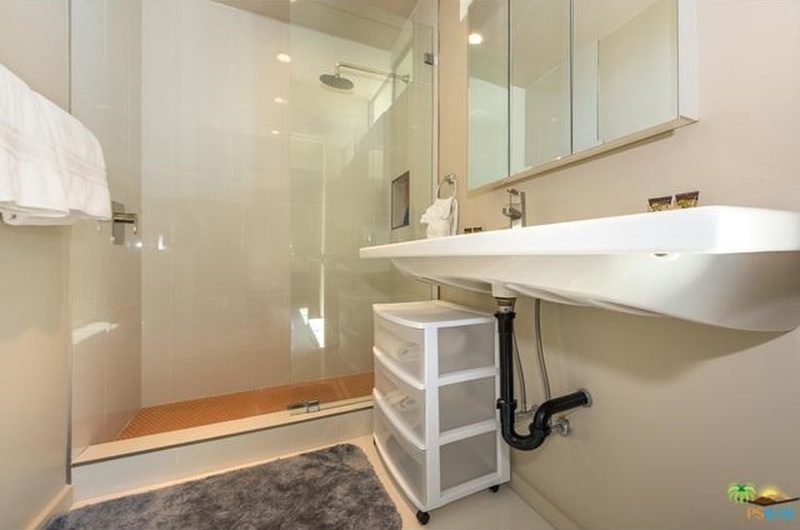 Both original baths have been updated with newer fixtures and tilework. 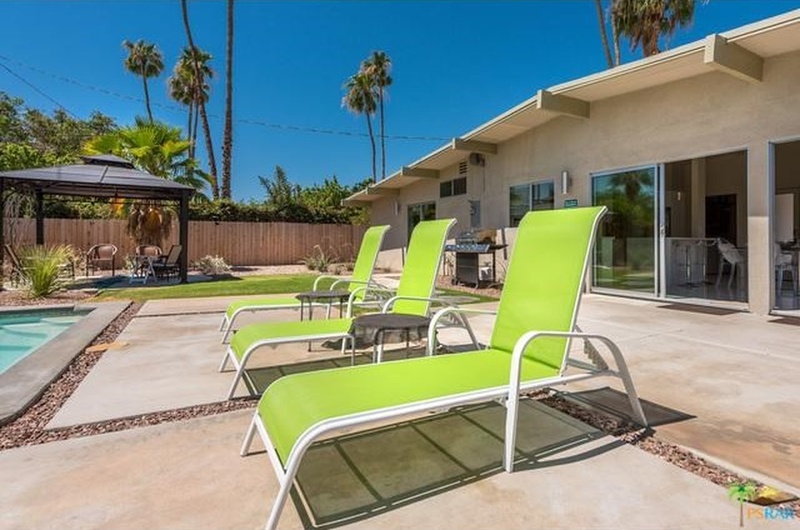 The backyard features a large, open yard with a concrete patio sitting off the living areas of the home. A large, rectangular pool sits at the center of the yard, with a raised in-ground spa with waterfall sitting along the north side of the pool. 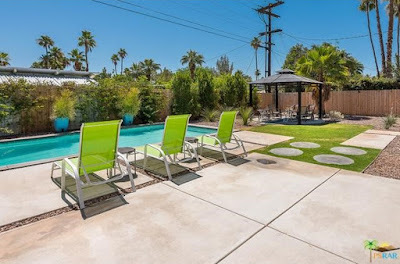 Modest amounts of turf sit near the home, and a small gazeebo sits along the southern end of the yard. 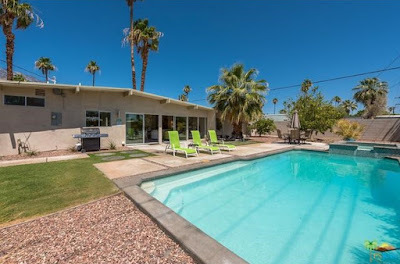 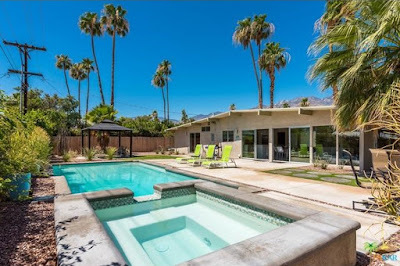 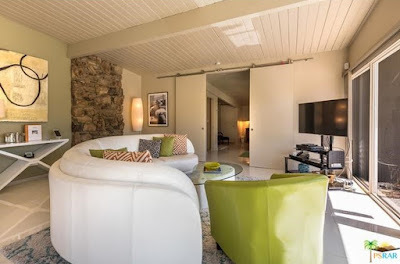 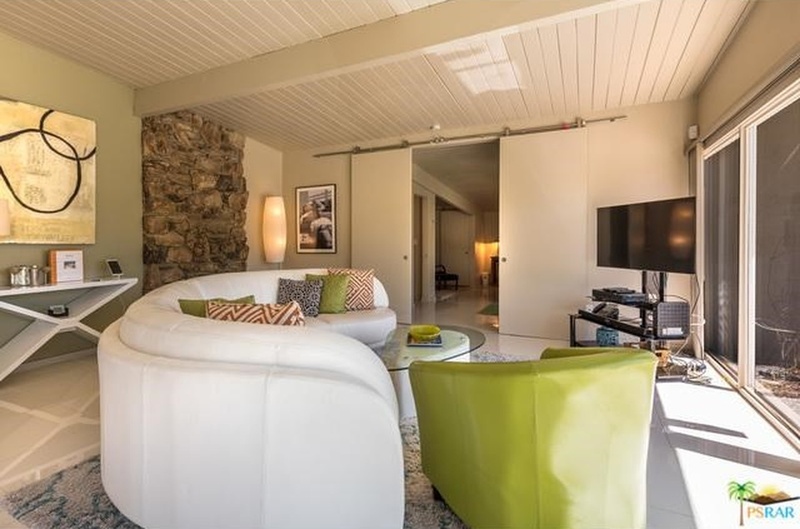 This midcentury Palmer & Krisel home looks like it’s ready to go and an easy fit for those looking for that perfect Palm Springs lifestyle.